When I say pizza night, I mean a lot of pizza! We all like our favorite types of dough and since we are home...we have what we like! I always start with the illustrator's dough so there is no cross contamination. He really likes Bob's Red Mill Gluten Free Crust made with flax eggs. He almost always wants peppers and onions so that is what he got tonight! Then I make the boys' dough, which is my go to recipe. Max likes thin crust with tomatoes. Jay likes thick crust with ham. 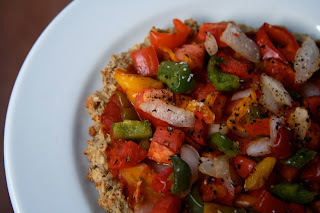 I like my good ol' flax oatmeal chickpea crust loaded with peppers, onions and fresh tomatoes (and a little kosher salt and fresh ground pepper). Gosh it has been too long since the last pizza night! 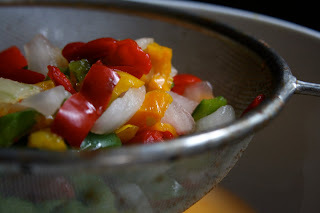 For ease of preparation on the peppers and onions (and to cut the cost), I use the frozen mix. 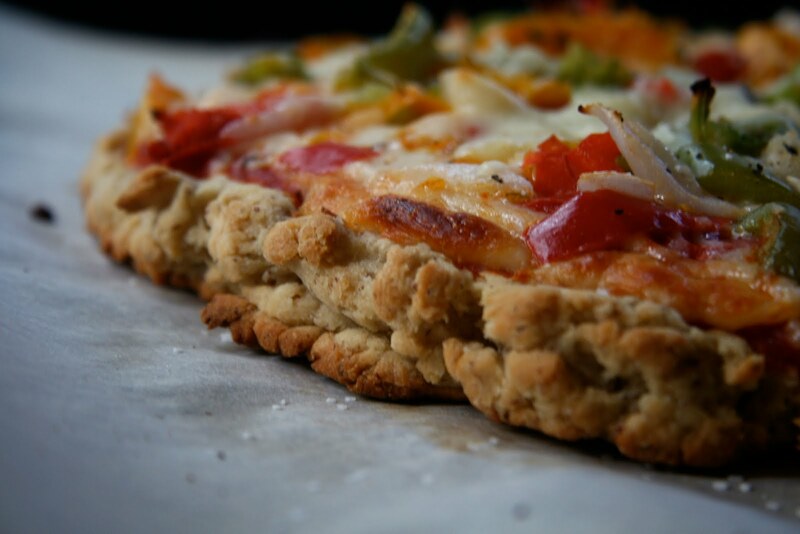 The key to not having soggy pizza with all those peppers and onions is to defrost them in the microwave and let them drain (squeeze out a little of the water too). Why has it been so long since the last pizza night? Wow, that seems like a lot of cooking. Looks delicious, though!! Oh my goodness. I want to try every single one of those crusts. They all have amazing texture! That's an awesome tradition! And I really need to start making my own dough... I think it'd be fun! I can't decide who's looks better...though I think Max is on to something with the simplicity ;) You must have been busy, making all of those different crusts!! 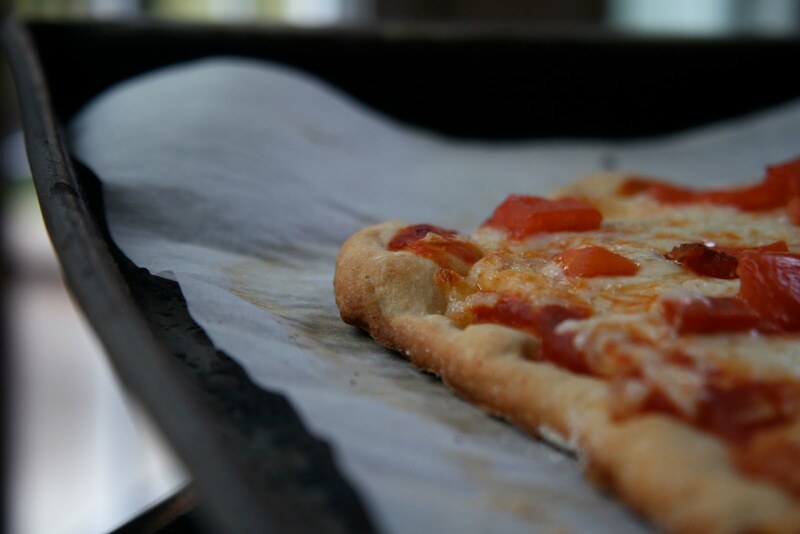 I've been thinking how it's been too long since I had a pizza night...why do I keep forgetting?! We actually went out for pizza tonight which we don't normally do. It was really great although so is homemade pizza. Yum pizza. I have a friend coming into town and he loves our gf pizza so I just might make him it now seeing this pizza, we shall see, haha! Looks great! i love that you used mega veggies. i cannot stand to just eat pizza without tons of veggies, and yours rocks! Hi Sarena! Can you do me a favor and email me your address I finally want to send you something for the BSI ! send it to ncl117@aol.com thanks! I'm ot a huge fan of pizza..but I'd gobble those up!! Yum! Bethan, I do Daiya sometimes and hummus works well too, but for me the pizza is not about the cheese, but more about the toppings and a good crust. pizza nights are always so much fun - and too far and few between! You're awesome for making so many pizzas!! 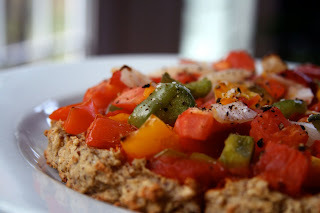 I love the chickpea/oatmeal crust idea - thanks! Wow, you really go all out for pizza night! I am guessing there are some good leftovers though since everyone gets their own? Mmmm, all those veggies look wonderful! and your crust sounds so good! I'm definitely going to have to try this! We have pizza night about once per week. I love Bob's pizza mix -- it turned out so thick and crusty for us (just how I like it!). 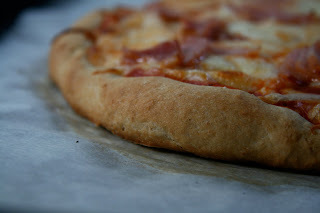 Last week I made a spelt crust and that was fantastic too. I think it needs to be a pizza morning right now. It's basically the only way to start a Monday off. this looks like so much fun. how old are your boys? Easy - Perfect! Great taste! !This Pizza is so easy and is absolutely delicious! I made this last night and my family absolutely loved it!These are so delicious and easy!